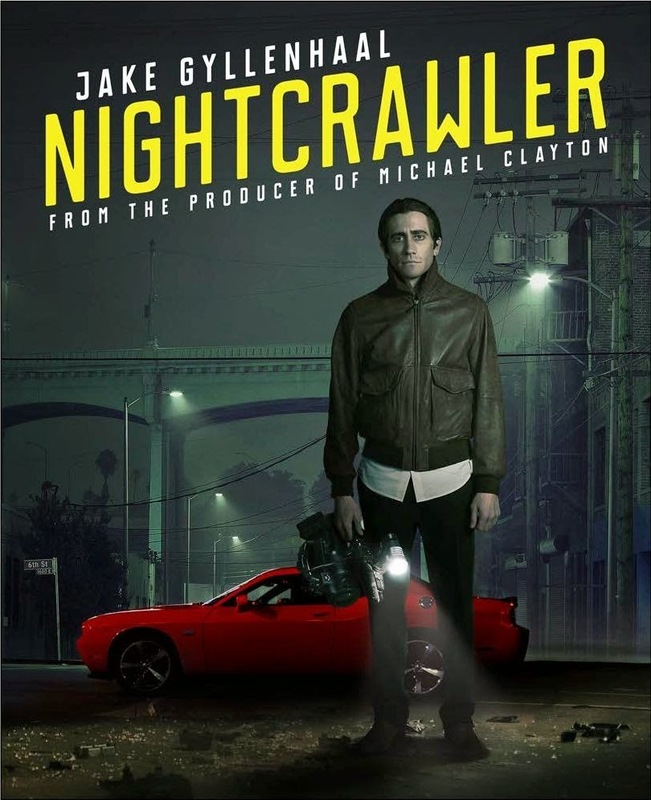 Dan Gilroy, known for writing films like Two For The Money, The Fall, Real Steal, and The Bourne Legacy, makes his directorial debut with Nightcrawler. It's a character study about how far ruthless, savage ambition will take a man. 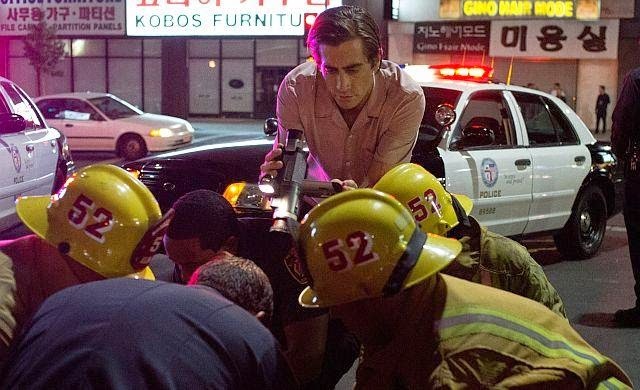 Louis Bloom (Jake Gyllenhaal) begins as a petty thief, stealing fencing, copper wire, and watches. Once he stumbles upon a car accident in which photographers show up to get video to sell to the news stations. Seeing how much gear these photogs can afford sparks an interest in Louis. So, he sells his bike to buy a camcorder and a police scanner. After a few failed attempts to get some useful video he encounters a crime scene with a gunshot victim. Another photog is already on scene, but Louis pushes the boundaries by walking right up to the medical staff and getting a much closer shot of the bloody victim. This marks the difference we see in him and other photogs for the rest of the film. He's willing to break the boundaries going further than anyone else. The result is Louis' brand growing exponentially with footage like no one else. He sells his footage to Nina (Rene Ruso) the graveyard shift news director for a struggling LA news station. He not only brings them exclusive footage they can use to headline their newscast, thus increasing their ratings, but he uses Nina as his insider to promote his company. Through careful scheming, betrayals, and blackmail he works his way to the top, creating a business around his ruthlessly ambitious news gathering. If he has to ruin a few lives along the way there so be it. He forces Nina into an intimate relationship with him (although their intimacy is never shown), and makes her promote him by threatening to take away what becomes the shows lifeblood. He knows that she would get fired if their ratings didn't climb, which they wouldn't if he didn't continue to bring quality footage that competing stations didn't have. Nina and Louis take the mantra "If it bleeds it leads," a little too literally. She's hesitant to accept Louis and his morally questionable footage, but she knows it'll bring in ratings and that she needs to work with Louis to keep him coming back with his exclusive footage. Jake Gyllenhaal gives a creepy performance in direct contrast to the type of roles we're used to seeing from him. He's a dispassionate observer of all things from house fires, car wrecks, shootings, and everything in between. The bloodier the shot, the better. There's a scene where he goes into a house where there have been several murders (having arrived before the police), he's not affected by what he sees at all. This story is his biggest breakthrough, but it's also his biggest ethically questionable piece as well. It's only later when he's editing the footage that he shows any sort of reaction to what he sees. Even while seeing these things in person, he has the camera to separate him from the reality around him. He shows no emotion whatsoever, and doesn't seem to recognize the existence of the ethical boundaries he's breaking. Yet there is a few underlying thoughts Gilroy wants us to think about. It's all too easy to be an emotionless observer in these situations. How often have we seen a video online and wondered why the person shooting the video didn't put the camera down and do something. However, more so than anything else, it's a critique of capitalism. News media is simply the tool with which to demonstrate his ideas. We play a role in all of it as well. We are the people watching videos of this kind, either online or on TV, on the edge of our seats. Louis may break ethical boundaries, but he does so knowing it'll sell. And he's willing to cross all ethical boundaries in order to make a sale. There's money in the unethical because we want to consume these things. If it weren't the graphic, bloody images that brought in ratings, perhaps Louis would have concentrated his ruthless ambition on something more pleasant. Although the character is anything but pleasant. It also makes us think about how a person like that can encourage, or at times force, us to compromise our own ethics to stay ahead. We'd lose our humanity to make money. It's a vicious cycle, and the professional world likely sees far too many stories like this. Sadly Gilroy doesn't make an attempt to right the ship, or provide any redeeming qualities to Louis. As such, it's an interesting, albeit, hollow story. When it's thrilling, it can be very thrilling, however it doesn't much care to show a decent into such behavior. Louis is clearly shown from the beginning to be an aggressive, violent, and uncaring pursuer of riches and job stability. While it's entertaining, and fast paced, it's lacking something. By the end his actions are of no surprise. And as for the comparison to Taxi Driver, Travis Bickle showed that descent in ways Louis does not. Bickle may have been a sociopath, but we can live with that film because he tried to do something noble. There is nothing noble in Louis' pursuits. He is a villain with no consequence. There's no opposing force to balance this story out. Law enforcement only begins to get suspicious of his activity by films end, and nothing comes of those suspicions. As a result it feels like half a story, where none of the side characters amount to anything more than tools to be used, or obstacles to be torn down. By films end he's just a more successful version of who he was when the film started. But one things for sure, it's sure to make us think twice next time we hear someone say, "I wouldn't ask you to do anything I wouldn't do myself."